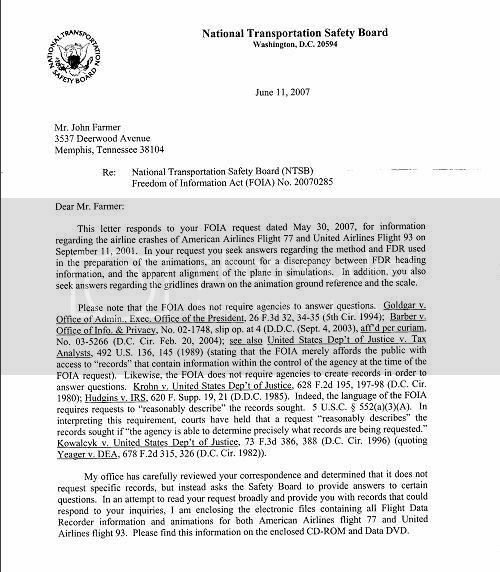 On the 2nd of July we submitted an FOIA request to the NTSB, asking for the document "Flight Path Study - American Airlines Flight 77", as cited in footnotes to the 9/11 Commission Report. The idea was to get a clearer idea of the final approach trajectory, and we were hopeful of success, as it seemed hard to imagine why this information could possibly be witheld any longer. We weren’t alone, though, and a few days ago this same report (and plenty more) was released to the National Security Archive. If you’re interested in the details and haven’t grabbed their documents yet, then read those first. It seemed our application was suddenly irrelevant, then. But maybe not. Soon afterwards a package turned up from the NTSB, and it did have more information than we’d expected. Thanks JT for the heads up!